Garbage is not something that you would want to have in your house or apartment if you are used to using a garbage disposal unit. These units are something that most people find really useful, and once you are used to them you do not want to live without one. You can help your garbage disposal unit to last longer by not putting bones or metal through it. Still these units can breakdown even if you use them properly, and the older they are the more prone to breaking down they become. Should your unit stop working then you need to contact Professional Garbage Disposal Services in Mesa, AZ to sort everything out for you. Without a doubt our firm is the best one that you can hire to fix your garbage disposal unit if you in and around this area of the country. 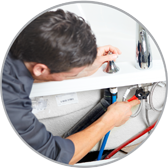 We will safely fix, remove, or replace your unit. Just contact us and we will examine your unit. From such examinations we take what is wrong with your unit and the best thing to be done to ensure you have a fully working unit once again. Our Professional Garbage Disposal Services in Mesa, AZ have the required know how to fix your unit if it can actually be repaired. Whenever possible our staff will attempt to sort out the problem without having to get spare parts. However if parts are needed then we will order them. Likewise if your unit cannot be fixed then we will advise you to buy a new garbage disposal and install that unit for you once it is available. Do not put up with a broken down garbage unit, hire our Professional Garbage Disposal Services in Mesa, AZ and have it looked at by the best. Great service is only a single phone call away.